BATON ROUGE— The East Baton Rouge Republican Parish Executive Committee voted to endorse Donald J. Trump for the Republican nomination for President at its meeting last Thursday. The committee spent most of the meeting planning how to raise its budget for the upcoming election season. The party will be helping with Republican campaigns for President and Vice President, U.S. Senate, Mayor-President, and Metro Council. The committee voted to hold a major fundraising event this fall to honor outstanding conservative leaders and organizations. They will invite Dr. Ben Carson to speak. To be added to the party’s email list, send request to capitalrepublican@hotmail.com. 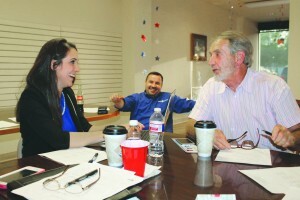 PHOTO: REPUBLICAN LEADERS Ruth Ward, Jason Engin, and Jay Lindsey enjoyed a laugh during the Republican Parish Executive Committee planning a fundraising banquet for the local party this fall.